Coridon (or Corydon) Ashton Hess (or Hesse) started out in senior lacrosse in 1897 with his hometown Cornwall Colts of the National Lacrosse Union, when he appeared in 1 game that season. The following season, at the tender age of 18, he became the starting goalkeeper for the Colts when he replaced James Broderick in between the posts. In 1898, he led the league in goals against average and was in a three-way tie for most victories with 9 wins from 13 games. In 1901, he had a shutout against the Montréal Nationals when the Colts blanked the Frenchmen 6 goals to 0. As a member of the Cornwall Colts, he was the losing goaltender in the first challenge game for the brand-new Minto Cup, a 3-2 decision in favour of the Ottawa Capitals. Hess departed the Colts after the 1901 season when he relocated to Woodstock – replaced by Jack Hunter, who would become the mainstay in the Cornwall crease until the arrival of a local youngster by the name of ‘Newsy’ Lalonde in 1905. In the 1905-1907 period, Hess played for the St. Catharines Athletics of the Canadian Lacrosse Association. The 1905 season was notable for Hess on a personal level as St. Catharines found themselves on the losing end of the first Minto Cup challenge series to feature open professionals. After helping lead the Athletics to the championship of the Canadian Lacrosse Association, they lost in their attempt to dethrone the now-professional Montréal Shamrocks of the National Lacrosse Union. Cory Hess thus found himself with the distinction of having played for both the first senior amateur and first professional teams in Minto Cup play. Hess was a hot commodity in his final season with St. Catharines, with both Toronto Lacrosse Club and Montréal Shamrocks both interested in acquiring his services. That year he helped lead the team to the league championship. The following season he played with the Hamilton Tigers in the same league. At some point after playing for Hamilton, he also played with a team in Brantford but his tenure there is unknown. Cory Hess would return to the Cornwall Colts in 1911 but struggled to a 3-8 finish. In his debut match of the season, having entered the game as a substitute replacement for Mark Cummins, he took a ball in his right eye and had to leave the game. After ‘Bun’ Clark was lured away by the New Westminster Salmonbellies, Con Jones brought Cory Hess out west as a replacement keeper for his Vancouver Lacrosse Club. Hess was part of a Cornwall exodus – consisting Angus ‘Bones’ Allen, Dalton ‘Dot’ Phelan, Don Cameron, Francis ‘Fid’ Cummins, and ‘Newsy’ Lalonde – that Jones had accumulated on his roster. He arrived in Vancouver with a highly-regarded career in Ontario behind him; at his peak he was regarded as one of the great goalkeepers of his day with his skill both with his stick and his sharp eyes. Those who strayed too close to his crease did so at their own risk, as Hess was known to lay out the lumber on occasion. A rookie by the name of Fred ‘Cyclone’ Taylor learnt this all too well during a game with Oshawa, when Hess ‘combed’ Taylor’s head with his stick. 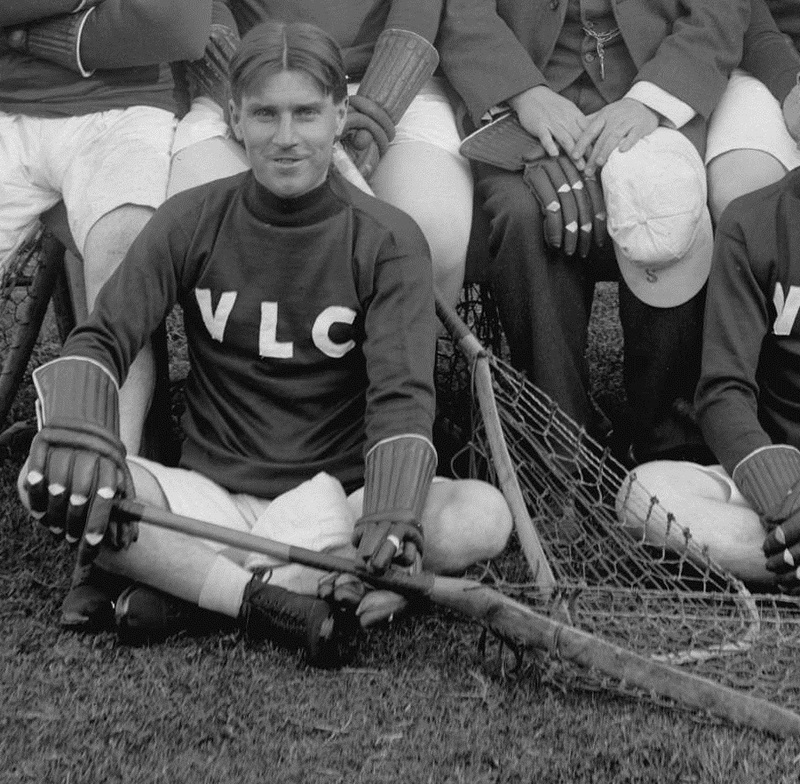 Hess played in 20 games for the Vancouver Lacrosse Club from May 1912 to June 1913 but by his second season on the Pacific Coast, he was showing his age. Con Jones became unhappy with his performance and looked to find a replacement after losing confidence in the struggling, 33-year-old keeper. Hess was dropped from the team after Vancouver‘s 7-3 loss to New Westminster on June 21, 1913. At the time of his release from Vancouver Lacrosse Club, he had a record of 4 wins and 16 losses. He let in 116 goals for a 5.80 goals against average – which really isn’t that bad considering he had matching .200 win percentages in both seasons with Vancouver. His downfall in 1913 was inconsistent play where he (and many of his team-mates) would follow up a hard-fought win or a close loss with an inexplicable rout to the Salmonbellies. In his debut season with Vancouver, at least the losses were close games for the most part. Hess was inactive as a player from 1914 until 1918 when he was reinstated as an amateur player. He played in 1920 with the Vancouver Athletic Club. The Athletics had reformed the year before as a senior team and were now playing in the Pacific Coast Amateur Lacrosse Association. He would later suit up for the North Shore Athletics in the British Columbia Coast Lacrosse Association. Once his playing days were finally over after the 1925 season, Cory Hess then helped establish, along with Carl Grauer of Richmond, a women’s lacrosse league in 1926 for the Lower Mainland. Hess managed the Pirates team in the league, from 1926 until around 1939 – which only lost three games in their first five seasons of play. The Pirates won the Grauer Cup, which was emblematic of the British Columbia women’s provincial championship, in 1927, 1928, 1929, 1930, 1931, and then later in 1939. For two years he was president of the women’s league until he stepped down, feeling there was a conflict of interest as he sponsored one of the teams. He then took up the position of secretary-treasurer of the British Columbia Lacrosse Association (the provincial association, not the professional league). While lacrosse was his primary sport, in his early years Hess excelled in scholastic sports. He was a baseball pitcher, played rugby, was a goalkeeper in soccer, and a basketball guard. In his later years, for over twenty years, he was the official timekeeper for ice hockey games at both the Denman Street Arena and Vancouver Forum. In 1968, Hess was inducted into the Cornwall Sports Hall of Fame in the Lacrosse category. He would be one of the last old-school field lacrosse players inducted to the Canadian Lacrosse Hall of Fame in 1985.